Success Resources to help you SOAR in your Job Search! ​A Platinum Resume partners with Allison & Taylor to provide another level of exceptional service to empower your successful job search. What are your former employers saying about you? 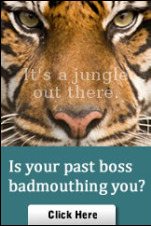 Are you being sabotaged by your 'old boss' and do not even know it? Could a small investment alert you to damaging information that is derailing your job search? One of the most common reasons job seekers are rejected for positions today is due to bad job references from their former employer. ​Allison & Taylor Insights: It is our experience in reference checking, that a reference does not need to be illegal in order to sabotage a job search. Reference checking services are important because a mediocre job reference can be enough for the job offer to go to another candidate. For instance, inaccurate information on position title; dates of employment or reason for separation; an untimely returned phone call, or the tone in a reference's voice could send the wrong message to a prospective employer doing your reference checking. Employing reference checking and reference consulting services prior to your job search can help you get the job you want. As basic as the need for a good job reference is, many candidates take little time or effort in being assured through reference checking that the references submitted to prospective employers are, in fact, providing the type of recommendation expected. Employee Background Checks can help job candidates get hired or promoted. Job applicants and existing employees can be asked to provide background checks. For some jobs, employee background screening is required by federal or state law. Allison & Taylor has experience in conducting extensive employee background checks that are compliant with the Fair Credit Reporting Act. Click here to get started on verifying your references! FREE Job Search Guide for the Holidays! Just click on the Gingerbread Man!